18 MILITARY MUSIC AND ITS STORY. 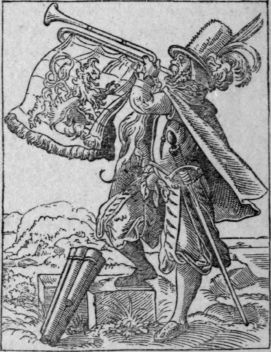 TRUMPETER (SIXTEENTH CENTURY). BY JOST AMMAN. de sa trompette ou s'appareillat, au second on s'armat, et au tiers son montat a cheval et partit." A similar order to this may be seen in the " Rules and Ordinances for the War" (1544).